I’m working on another baby name quilt. I’ve got my appliqué letters cut out and ready to be applied to the quilt top. I love this vibrant green print. It is making me wish for spring! Are you ready for spring to arrive? I am MORE than ready for Spring. I was laughing at myself a little because I pulled out a very vibrant set of blocks to work with--I know it's because I'm craving some color in my environment ... like maybe the first flowers of spring? Make it come today! We are having another snow storm. Love your bright letters. Do you enlarge a font from your computer or have a book to trace from? Just curious. 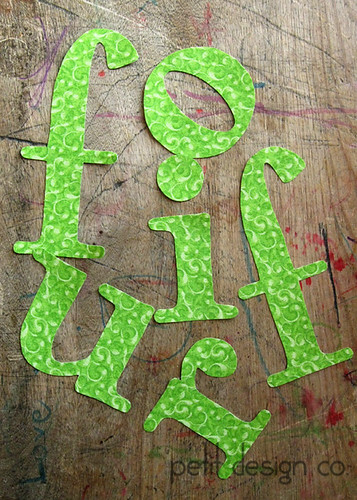 I'm always looking for a some way to make letters.